Sucralose is the super-concentrated, no-calorie sweetener found in popular soft drinks like Diet 7-Up and in popular "sugar substitute" brands such as Splenda. However, the grocery-store stuff, like Splenda, has nasty fillers, "bulking agents" and (worst of all) maltodextrin (which does affect blood sugar!). Our Sucralose is 100% pure. This is not the stuff you get in the local grocery store! Pure, industrial-grade Sucralose Concentrate (powder), All-Purpose No-Calorie Sweetener, in an 83g (3oz.) 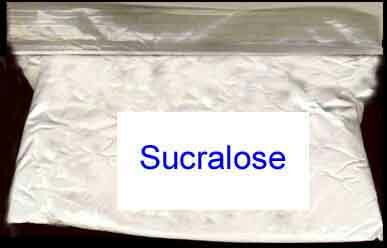 packet that is equivalent to 50-Kg (110-Lb ) of regular sugar!! Comes in small, safety-sealed ziplock packet (shown). Easy-to-use ... Complete usage instructions included. Ideal for diabetics diets, low-carb diets, weight control! Perfect for homeade sugar-free candies and desserts! MySQL: 0.0000 s, 0 request(s), PHP: 0.0299 s, total: 0.0299 s, document retrieved from cache.